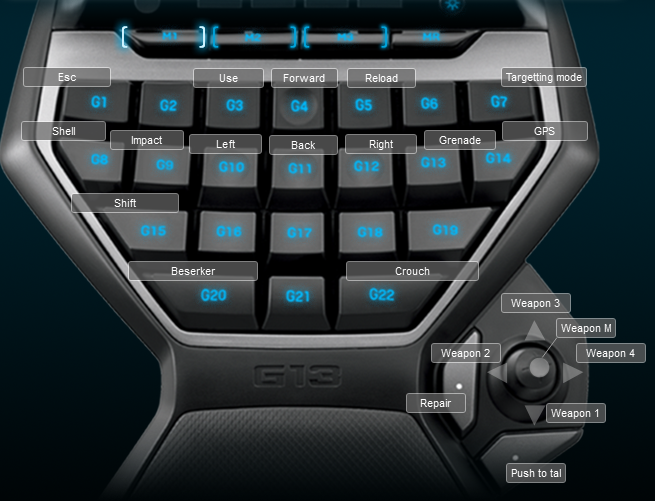 The Logitech G13 default profile for Red Faction Armageddon was not well written and had the old macro keys. I created a Red Faction Armageddon Logitech G13 Profile just because I started playing and I wanted a better profile. Re Faction Armageddon increased the number of keys that were used in the game. I never used berserker in the game so I placed it in a more out of the way place than might be useful for those who do use it. I would recommend replacing impact or shell with the beserker if you use it more. The layout in the screenshot below worked for me. On the mouse I kept melee and jump.